This may sound discouraging because no doubt you’ve put in an immense amount of energy to get to where you are. However you need to understand that building your leadership reputation and skill is a career-long growth journey. It’s something you need to continually focus on and improve. Leadership is something that will retain the dedicated and spit out the ones who give up too easily. Below I’ve highlighted five important personal branding tips that are crucial for you to focus on if you want to make it as an established leader. 1. Build a Solid Leadership Brand. A strong leadership brand (personal brand for leaders) is the foundation for your entire leadership reputation. You need to be clear on who you are and what value you bring to a company. What makes you unique? How are you different? What drives you to achieve success? As a new leader, you need to be clear on who you are and what value you bring. If you’re not, how do you expect your boss or executive level decision makers to see it? When you develop your leadership brand, you need to look at your core values, strengths, beliefs and vision. This is what is going to distinguish you from the rest. This is what will make you unique and stand out. Once you have your leadership brand clearly defined, it’s time to step out and become visible. No more hiding in the background or behind your desk. You need others to know who you are and what you’re capable of. Being visible will put you top-of-mind of decision makers, people who can have an impact on whether you get the next promotion, or not. In order to be visible, networking is critical. You can network at carefully chosen networking events or organise one-on-one conversations with people who matter. Networking is a chance for you to take your personal brand as a new leader into the real world. Reaching out to a mentor is a sign that you’re committed to growing as a new leader. In order to rise up in your career, you need to learn from people who are already where you want to be or have been where you want to go. It’s those people who will be familiar with the obstacles you’re going to face on your leadership journey and will help you navigate through those obstacles. When reaching out to a potential mentor, you must do it carefully. Respect that person’s time and position. Don’t automatically assume they’ll jump at the chance to be your mentor. Ideally, get to know them first and develop a connection before you pose the question. 4. Communicate the Leadership Opportunities You Want. A common mistake new leaders make is they don’t communicate to others what their leadership aspirations are. Either they feel they’re not worthy of them so they hide their leadership aspirations. Or they assume people automatically know what their leadership aspirations are and think they’ll be miraculously picked for the next leadership opportunity. As a new leader, you need to take control of your leadership journey. Only you know where you truly want to be in your career. It’s your responsibility [link] to communicate this to your boss, coworkers and other stakeholders. 5. Don’t Succumb to Self-Doubt. Self-doubt, or the Impostor Syndrome, is a common leadership hurdle whether you’re an emerging leader or an established one. In the Leadership Presence Masterclass I run, when I reveal that 70-80% of people experience self-doubt at some stage in their career, everybody in the room exhales in relief. Self-doubt is common. It’s okay to doubt yourself in situations that are new or challenging. In fact it’s quite a normal human reaction. But you do need to find the strength to push through your self-doubt and rise to your new leadership challenges. Write down your self-doubt to help detach yourself from it. What is it you are feeling? Rate how valid or justified your self-doubt is: 1= justified; 5 = not justified at all. If it is justified, what will you do to improve on that area? Do you need to work on a particular skill? Do you need to enroll in a course? 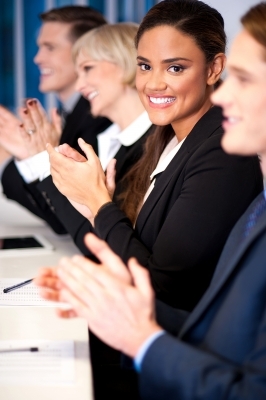 Succeeding in leadership when you’re a new leader or an emerging leader can be challenging. However you should never feel like it’s out of your reach. There is an abundance of resources, workshops, training and coaching that is available to you. All you need to do is start searching. On the Executive Impressions website, there are over 100 free articles that can support you in your leadership journey. 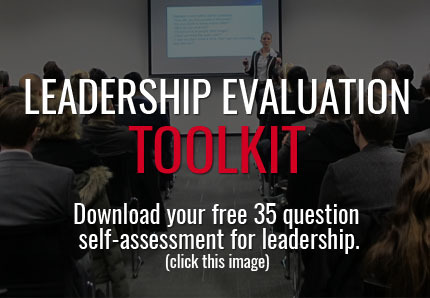 You can also download the Leadership Evaluation Toolkit to assess where you are positioned as a leader. If you’re located in Perth, you are welcome to register for the Leadership Presence Masterclass or the Leadership Communication Masterclass that I run. Get the 2019 Event Schedule for my leadership workshops here. If you would like tailored, personalised advice, my 6-month leadership coaching program or 3 Session Power Package could be a better fit for you. Sessions can be taken online or in-person if you’re located in Perth. Please e-mail me at contact@executive-impressions.com if you would like to know more.